With all the boating opportunities in Vermont, it's no wonder there is so many boat dealers throughout the state offering a wide variety of boats for sale. If you like to sightsee, cruise, fish or water ski, there are dealers with your dream boat for sale. To locate a dealer near you, first select a quadrant of the state. Then find a boat dealer listed by proximity to cities, waterways, campgrounds and attractions in VT. Some of the major cities we have listed for your convenience include Newport, Wilmington, Fair Haven, Vergennes, Wells, Barre, Randolph, Montpelier, Morrisville, Burlington, Bennington, Brandon, St Albans, Rutland, Waterbury, Hartford, Lyndonville, Springfield, West Brattleboro and Shelburne. Vermont boat dealers are familiar with boating requirements in VT. They can easily assist you in selecting the right boat for your intended use, as well as make suggestions for boating safety and ways to keep operating costs to a minimum. 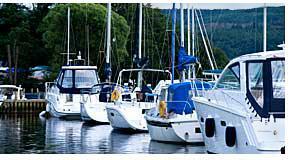 Once you acquire the ideal boat, we'll help you find places to boat in Vermont. Lakes are listed by quadrant within the state for convenience. The list of major lakes includes Lake Memphremagog, Lake Willoughby, Arrowhead Mountain Lake, Colchester Pond, Seymour Lake, Lake Bomoseen, Fairfield Pond, Lake Carmi, Harriman Reservoir, Kent Pond, Lake Champlain, Island Pond, Maidstone Lake, Lake Dunmore, Lake St Catherine, Woodward Reservoir, Somerset Reservoir, Chittenden Reservoir, Lake Rescue and Silver Lake. Rivers too can be a fun place to go boating and are listed by quadrant also. Some of the major rivers we've identified include Mettawee River, Otter Creek, Missisquoi River, White River, Clyde River, Barton River, West River and Winooski River. 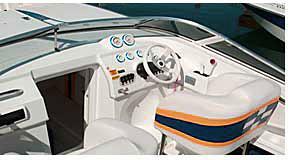 Throughout VT you may find manufacturers of boats, trailers or boat accessories including Adirondack Guideboats and Advanced Machine & Tool Props. Boat types commonly used on VT waters. We'll help you find the boat, waterways and resources to make owning or renting a boat in Vermont an absolute pleasure. For further information about boat registration in Vermont, contact the Vermont Department of Motor Vehicles - Boat Licenses located at 120 State Street, Montpelier, VT 05603. The phone number is 802 828-2000.